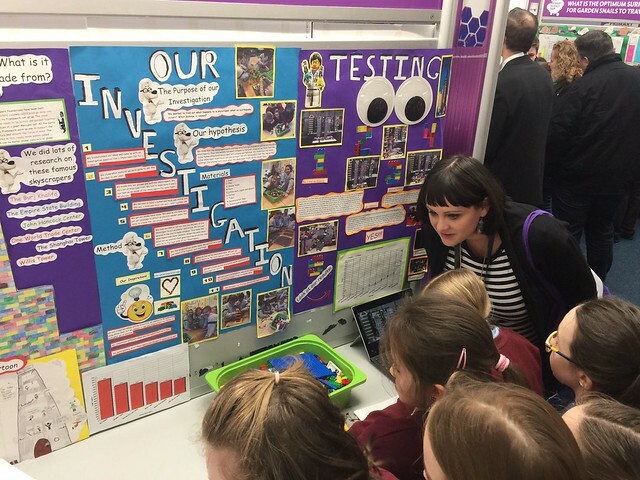 Ms.Concannon's class were selected to participate in this year's RDS Primary Science Fair which was held in conjunction with the BT Young Scientist of the Year competition. The class project 'Can a Skyscraper fall for a tremor?' was very popular among the judges and the visitors at the event. The girls were asked lots of questions about their project and demonstrated how Lego skyscrapers actually fall for a tremor using their specially designed table (courtesy of Noel, our caretaker!). The girls had a great day and got the opportunity to look at lots of other science experiments & projects, participate in workshops and visit lots of stands showcasing STEM activities!